When it comes time for you to place those precious contents into something, don't skimp on the time capsule container. Why spend time and money on your time capsule contents only to have the recipients some 50 years hence open a mushy mucky mess? If you don't care about that, then by all means use anything that comes handy. A plastic garbage bin would do. We assume you do care about sending the items to the future intact and in good condition. Towards that end, we caution you to ask questions of your time capsule supplier to make sure of the materials and sealing methods of the time capsule you choose. What, if any, fail-safe methods are in the time capsule design to make sure it'll protect the contents over time? What is the thickness of the material used for the container? If aluminum or copper, it should be thicker than stainless steel because those materials are softer and not as strong. We assume you will not use mild steel of any kind, even painted, due to the corrosion that quickly eats away the container walls. We also assume you will not use plastic containers due to the ease with which they crack with age. If the container is made from composite materials, ask what exactly those materials are and why the maker chose them. The same conditions may not apply to your placement. If the time container is of welded construction, how good are the welds? Are the welds properly made and strong enough to withstand moisture over time while sitting in the ground? How does the time capsule seal? If the container seals with any kind of rubber gasket, ask what kind of rubber. Ask what its aging characteristics are. For a time capsule, withstanding heat or pressure is not a concern. Aging is. Why? As time goes by, the rubber deteriorates. It cracks. Then, it allows moisture (either water vapor or water or both) to seep into the container and ruin the contents. The time capsule to the right was placed in the 1940's in Hollywood, California, and included a roll of movie film from Gone With the Wind. All the items inside were ruined. The container leaked. 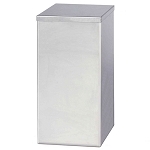 We've chosen stainless steel as our time capsule material of choice for several reasons. It's not the cheapest, but it's sturdy, relatively easy to work with, and corrosion resistant. It has a proven track record of success. The way a time capsule seals is important, too. This is the weakest point at which moisture can seep into the container and ruin the contents. Our best time capsule design is the Bolted 3000 Time Capsule. 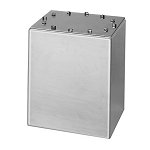 Its strong structure is easy and safe to bury without any supporting enclosure. But it's the sealing design that makes it stand out from the rest. The sealing design is a fail-safe method of making sure no moisture of any kind can get into the capsule. The Bolted 3000 Time Capsule is unique with its half inch flange on top of the container. This flange features an exact machined O ring groove to fit its preformed silicone O ring perfectly. Silicone, by the way, is the best aging gasket material. But that's not all. We drill and tap each of the bolt holes. Then we cap them off on the bottom (called 'blind'). This makes it impossible for any leakage to occur (should the first line of defense, the silicone o-ring, fail). No further protection is necessary. The service life of the Bolted 3000 Time Capsule can easily reach 100 years and beyond. Its design is expensive because of the additional machining and labor of its manufacture. What if you did not need a time capsule to last that long? Can you provide a less expensive alternative? Yes, you can. 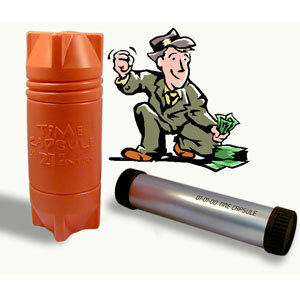 The simple Capped Cornerstone Time Capsule Box 4200 model is just that. It's simple, and it's affordable. 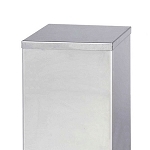 This time capsule container uses the same sturdy material walls that the Bolted Time Capsule 3000 does. The sealing method is different. This time capsule box has a simple lid that fits down over the body of the time capsule. You seal it by hand with the sealant kit included. You should read all the instructions carefully, of course, but any handy person will be able to seal it up with ease. The sealant manufacturer estimates the service life after curing to be 50 years. To extend that time, we include a wax treatment that you apply after the initial curing of the sealant. Thanks goes to the Smithsonian for suggesting the wax overcoat. This wax overcoat is simple, safe, and effective. It's easy to remove and provides that extra layer of protection. The Future Line Time Capsules are not box shaped but rather are cylindrical or tube-like in design. The cap fits on the body with a twist off or threaded design. A thin gauge 304 stainless steel is the material used to make the Future Line Time Capsules. Because the material is thin, we recommend caution if you bury them. Follow instructions so that they sit upright in the ground. Seal off the area above them well. 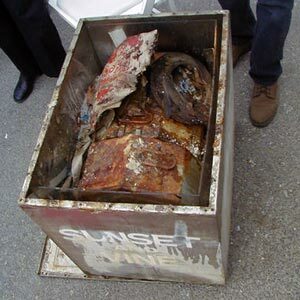 It's possible the time capsule would protect its contents outdoors over time without sealant. But we provide the sealant as an added layer of protection. It extends the life of the seal so that the 50 years of the sealant's life becomes the expected service life of the time capsule. To extend that even more, we provide the same wax treatment overcoat and estimate the life to be 60 years or even more. We provide the Future Line Time Capsules as affordable time capsules so that individuals, groups, students, and others can protect their items properly over time without needing to spend a lot of money. We offer the factory second or slightly blemished versions of these time capsules at deep discounts as well. In our opinion there is no good reason to gamble on your time capsule container! Ships promptly! Time Capsule Box holds up to 425 or more documents, photos & artifacts safely. Ships promptly (1-2 days). Special order item, allow 6 to 8 weeks plus shipping time. Ships promptly! Time Capsule Box holds up to 720 or more documents, photos & artifacts safely. Ships promptly (1-2 days).